Outside, it’s the season of cross-country skiing and snowman building. Inside, though, the Ohno team has been creating a new website for Tri-City RV and dreaming of summer nights making s’mores over campfires. If you need a summer fix, visit the website at https://tricityrv.com/ There, you can learn more about the family-owned and operated RV sales and service business that John Sr. and Jenay Korpal opened in 1995. We’re pretty sure their story and the testimonials on this site are going to inspire a lot of families to put some camping trips on the calendar this year. While you’re browsing the site, click on the Staff page and start reading the biographies. Each person on the staff suggests a favorite camping site and recipe. You’ll also want to take a moment to check out the selection of new and used RVs. 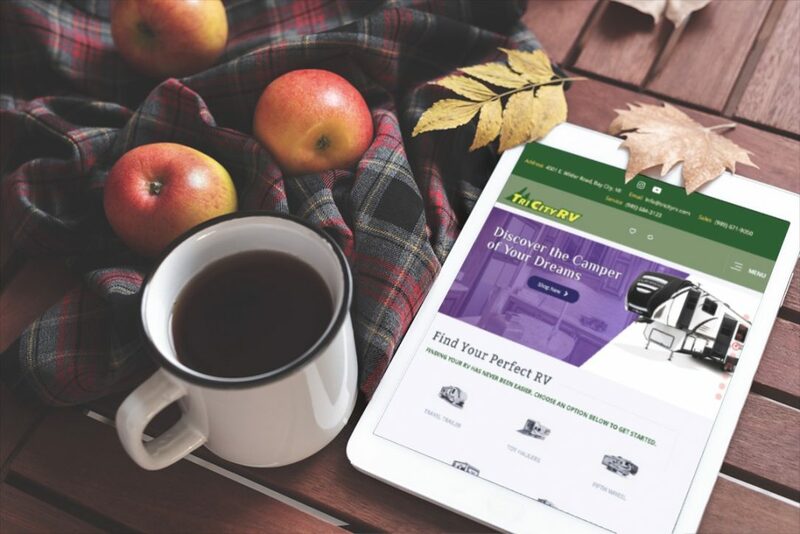 You can search for your next RV by the manufacturer, floor plan, or style on the website without setting foot in the cold. Once you’ve found your dream camper, go to the Customer Support menu item and discover a wealth of tips for buying, maintaining, and using your RV. No matter the season, the Korpal family and their team at Tri-City RV can help your family find the right RV for your camping style.